How to Plan a Wedding on a Small Budget | Feel The Magic Ltd.
Let’s be honest, weddings are an expensive event. Any time you mention the word ‘wedding’ to a supplier, it will no doubt raise the cost. Now whilst any couple will want their wedding day to be special, that does not mean you need to spend an absolute fortune on all aspects of the day. Making sure you plan your wedding day and think about ways to reduce the overall cost are important, especially when you are trying to plan it on a budget. In this post, we have come up with 20 ways that could help reduce the money you spend, whilst still being able to have a great wedding. Whether you choose to follow a couple of them or combine them all – there are some great ideas to save some money. When writing down the list of people to invite, it can easily become 200 names without even thinking about it too hard. But do you really need to invite that friend that you haven’t seen since school?? It seems harsh, but you do need to think that there is a cost that goes with everyone you invite. Whether you are paying for caterers or catering yourself, you will need to pay to feed everyone on the list. Come up with the list by all means, but then go back and review the list and ask yourself whether you really want them there or is it down to your parents wanting them there. If you explain that you are on a budget, then they will understand. Try reducing your initial list by 20% and if possible try again. Have you any friends with a musical talent? Or a friend who takes photography seriously and you trust them to capture some high-quality images? Nowadays it isn’t seen as rude to ask for money to help with the honeymoon costs in a wedding poem, as most couples are already living together, and wedding gifts are a bit ‘old-school’. But if you do have talented friends it is a great way of saving money on your wedding day. Hotels or Wedding venues can cost £1,000’s to hire + all the costs associated with feeding your guests, etc. my sister-in-law got married last year and the venue alone cost £10,000. This can be a real way of saving money, especially if you are on a budget. Consider if you have a family member or friend with a decent size garden. Hiring chairs will cost a lot less than hiring a venue. But with the way the weather is in this country, another option could be a local social club. Most let you hire the room for free, just paying a security deposit. They are normally quite accommodating you with decorating the room to make it look just the way you want it. It also covers the drinks aspect, as hiring chairs and buying alcohol could end up being costlier. As long as the guests are fed, they are happy. So why should you pay £100 a head for a fancy sit-down meal when you could do something yourself. Creating a buffet-style selection allows everyone to eat what they would like and still capture the magic of a wedding. Another option is to talk to a local family-owned restaurant to cater for you. They will normally go the extra mile to make sure your guests are happy and will thank you for the business (normally with a discount). Another route is to combine both. We were at a wedding reception recently; the bride and groom had got married abroad and wanted to do a reception back here for those who couldn’t make it abroad. They had a local company come in and offer a hot buffet and a family member had arranged a selection of sandwiches, etc. alongside. It doesn’t not have to be an extravagant affair when feeding your guests and you can save a fortune. Compare a wedding where you are paying £95 a head at a sit-down meal or a hot and cold buffet which will probably cost a couple of hundred. There are plenty of ways to save money on them. The key bouquet is the brides, but the bridesmaids could have a single flower instead of a bouquet. A single rose or lily instead? You will also find that fake flowers will be considerable cheaper, and no one will really notice unless they get up close. You might consider exploring wholesale markets for silk flowers, etc. and you will be paying wholesale prices, instead of retail prices. Another saving! You will also be able to keep it. If you are dead set on real flowers, it might be you have them in your bouquet and save the money when looking at button-hole flowers or your bridesmaids. I know it is traditional to give them a gift, but we are talking about ways to reduce the overall cost of a wedding. If you still want to get them a gift, without breaking the bank then I suggest you look small. I got my grooms men cufflinks, they cost about £10 each online. My wife got her bridesmaids necklaces, which cost about the same. It doesn’t have to be anything too expensive. As they will know it is an honour to do it. But if your budget doesn’t allow for it, why not write them a very personal thank you card. Share with them how much you appreciate them being a part of your day. Think about it, a cufflink is something that doesn’t get worn very often, but a heart-felt thank you will remain for a long time. If you want a simple wedding invitation, you could create your own and print them off at home. Searching the web can give you some great ideas. Or you might want to explore our Celebration range. We offer a simple range of invitations and you can get 50 invitations would set you back £16.50. Which may be preferable if you do not own a printer. If you decide to get married at home or outdoors and want to save even more money, you could look at setting up your own playlist and borrowing some speakers. This would save you money hiring a Wedding DJ. My only suggestion with this option is task someone in your wedding party to keep an eye on it. If the music stops for any reason, you don’t want to be the one dealing with it. There is something about having a wedding DJ, as most people will expect to see one. But if you are having friends doing a music set (local band, etc.) then you may want to save the money on a DJ. This allows you to have something for when the band are not playing. If you are choosing the at home or outdoor option, there are still ways of ensuring your guests can enjoy themselves with a drink without hiring an expensive mobile bar. Keep an eye out for special offers on drinks in your local supermarket. Or checkout your local wholesaler for deals, this is a good option if you are buying in bulk. Alternately, if you are choosing one of these options – you could choose a bring a bottle option and only buy some prosecco (it is cheaper than champagne) as a drink for toasts or a welcome drink? See if you could get a discount from your DJ, Photographer, etc. if you display business cards or a card with all of the vendors you have used on each place setting. Everyone business owner will recognise the need for advertising and this could mean you get a great discount on their services. It is worth asking the question. This could be a great option if you would like live music at your wedding or are looking for a photographer. Speak to them about recommendations for someone who would perform to help with their portfolio. My only watch-out, as a wedding photographer, is if you are asking about a photographer for your wedding – ask to see some of their work first. If they have only done landscape images before, it is a different skill set taking wedding photographs. There is a reason why wedding photographers charge what they charge. There are always options to reduce the cost but ask to see it first and make an informed decision. I am sure you are already looking at ways to get these without spending a fortune, so one key element for this is – many brides decide to sell these once they have gotten married, this makes it a great option for someone looking to get married on a budget. If their theme is very similar to what you want, then why not. Facebook & eBay are great places to keep an eye out for these opportunities. Another factor is to search for exactly what you want… and then shop around to see if you could get it cheaper. If you are buying a number of them (50 wedding favours for example) then check out wholesale suppliers, you will find again there are discounts. This can be for both the bridal gown and the bridesmaid’s dresses. Depending on the type of dress you want your bridesmaids to wear can help you locate a retailer that does the dress you want, without the cost becoming too high. It might also work to your advantage, as if the dress is a type where they will wear it again, they may even help towards the cost. Also, keep an eye out for the sales as you may get a big discount. You may also save a lot of money if you choose a simple gown to wear as your wedding dress and maybe add a few accessories to make it look awesome, you won’t have the hefty price tag that goes with a bridal gown. Hiring suits can end up being just as expensive as the bridesmaid dresses. Morning suits can end up costing you £100 per suit to hire. But you may find the groomsmen already have suits the same colour?? If they all wear a black suit, which mostly look the same – it can be a great way of saving money. But back to the hiring of suits, hiring a normal suit will be much cheaper than hiring a wedding morning suit. It is definitely worth reviewing what you want, shopping around and again making an informed decision. Depending on the ring you are after, these can end up costing you a lot of money. Wedding rings have a special meaning you the couple, but it doesn’t mean that you have to spending £1,000’s on them. It is definitely worth looking into it. Platinum is becoming more popular, but Titanium is harder wearing (it will look great for longer) and is a lot less money to buy. My wedding ring looks great (to us) and is made from titanium. We bought it from the Jewellery Quarter in Birmingham and combined with my Wife’s Wedding Ring which was White Gold, we spent £300 on both of them. That was we considered affordable and we also have recently been back to buy her Eternity ring from the same place. If you are working to a budget, then it is definitely worth shopping around and maybe also worth a visit to the Jewellery Quarter, as you will save a fortune. There are a couple of factors to consider when booking this. Don’t tell the travel agent it is a honeymoon, as this will increase the cost and it might be you delay it for a better deal. I know a few friends that have had a few days off after their wedding and made it a staycation or maybe a weekend away locally – and made their honeymoon a holiday when they could get a better deal (i.e. when it isn’t the school holidays). If you do want to go abroad for it, again book it as a holiday as saying it is a honeymoon does not always guarantee you will get a better deal. Search online for deals, i.e. travelsupermarket.com. You could also include a wedding poem in your invitations, where you ask for money to help with the honeymoon costs. There is also something to consider when paying for your wedding, find a good credit card that offers air miles or the like and use it pay for your wedding with advantages when booking your honeymoon. I am sure you are already chatting with your friends and family about your wedding plans, but it is definitely worth chatting to them about ideas to save you some money. You can also get their thoughts about your ideas and whether it is a good idea. Some ideas can seem too drastic and a second opinion can help you see whether some will be welcome. I have mentioned it a couple of times throughout this article, but when booking a supplier (Wedding DJ, Wedding Photographer, Wedding Flowers), try not to mention the fact it is for a wedding straightaway. This is a sure-fire way of increasing the cost. Sound them out, listen to them talk to you about their services and then subtly bring it into the conversation or even just book them for an event (like the DJ). This is a must to stop any impulse buys. Going to wedding fayres gives you loads of ideas, but before you know it you have bought something, that maybe you couldn’t afford. A Budget sheet will help you to know what the costs are on everything, when it is due for payment and how you are going to pay. Plan how your wedding day and reception are going to go and what you need for it. Plan time to shop around online for the best deals for the items you need. You need to be really organised to ensure you keep to your budget. Don’t be surprised if something goes wrong at the last minute – a little detail might not work out the way you intended. Don’t worry about it and do not be tempted to throw money at it. It is most likely to go unnoticed – and usually someone in the wedding party will come up with a solution, meaning everything goes as planned. Back to our original point, weddings can be very expensive nowadays, but that doesn’t mean there are ways of having an awesome wedding day without the huge cost. If you have any other ideas you would like to share, please share them in the comments below. 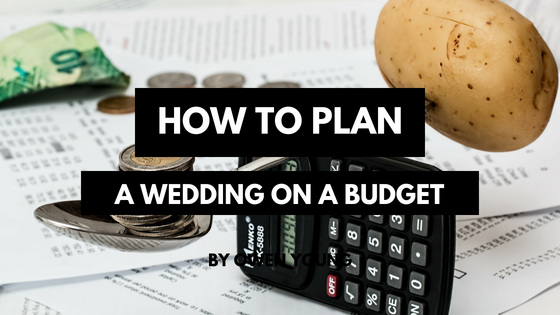 I would love to know your ideas on how to plan a wedding on a budget. That’s great! I definitely did a lot of these hacks during my wedding last year! For invitations, I did email for everyone and there were no problems! I think it is really great to find ways to spend less for a wedding because they can get outrageous. And really, at the end of the day, it’s about you and your sweetie. Sometimes it’s hard not to get caught up in the details when wedding planning. I totally understand that sometimes you want to get everything absolutely right – but you can still do this without having to resort to spending money you do not have. The one thing you want to be able to say is you enjoyed your wedding day. Love your site, it looks beautiful. My friend is getting married soon and the money side is definitely stressing her out. Wouldn’t it be great if we didn’t have to think about the $$. Think the suggestion of bridesmaids just having one flower is great, I was also thinking maybe using the silk flowers for the church pews would be OK.
We have been looking around to do the invitations ourselves and will check out the Celebration range too. Can you buy larger amounts or do we just buy 3 packs of 50 (I think she has 150 guests)? Hopefully we can make some savings, just a little from a few areas, and reduce the cost and the stress. Thanks again. thanks for the feedback. It is a shame as it can mean your friend worries about her wedding day, rather than enjoying it. But there are definitely ways to reduce the cost without making the wedding look cheap. Everyone is after a bargain and if it still looks awesome, why worry about how much it cost. The celebration range is available in a number of quantities and if you do not see a number you like, just send us an email me an email at john@feelthemagicweddings.com and we can help in any way we can. The key things I would suggest when you are planning a wedding on a budget is plan what you want and how you want it to look, then shop around. With a bit of perseverance you will find some great bargains. Thanks for these great tips on how to save money when planning a wedding. My brother and his fiancé are getting married soon — so they are trying to figure out how to save cost. For my own wedding we did a few things you mernioned like make our own invitation cards, had friends cater the wedding, and found a relatively cheap place to do it at. It helped save a good amount of money — and we still had a very memorable wedding. thanks for your comments – i hope that your brother and his fiancee have a day to remember and that it doesn’t get affected by them worrying about the costs. The ideas you mentioned for your own wedding are great ideas and hopefully they will make use of them. It is the memories that we create at these events that will be remembered and all the little details – so why spend a fortune if you can’t. Good idea not to disclose your honeymoon trip. I think a lot of parties tend to take advantage of the occasion and hike up the prices. A friend of mine got caught on this scheme and ended up paying a lot for transport, accommodation and even on hotel food. It’s ridiculous! Hi Cathy, thank you for adding your thoughts. It shouldn’t be the way it is, but saying “it’s for a wedding/honeymoon” seems to add a lot of money and not just a few quid but £100’s. Another option could be shopping online for a holiday and then when you get there tell the hotel it is your honeymoon. They will normally look after you anyway, so why pay over the odds. When I married my wife, we made sure to do all the things that are in this list now. I can confirm that being a bit meticulous and following what you listed. These really are helpful tips. I’m sure a lot of engaged couples could benefit from these. I sure am glad we were able to trim down the budget in the end! it is a shame that the cost of weddings can cause real anxiety in couples, to a point where some decide not to get married due to the costs. But there is always a way of cutting down the costs without the need for a wedding to look cheap. At the end of the day if the couple getting married have had a great time, it doesn’t matter how much it has cost. Thanks dear or this wonderful article, I Find it very Lovely. I agree with most of your suggestion but I think that there few of them are difficult to achieve at that moment due to pressure. Take for instance “Do your own music”, & “Stocking the bar yourself”. The pressure that period won’t even allow you think about doing those things yourself. All you will think of is who will get things absolutely right for you. thanks for your comments – that is a very good point and all of these suggestions will not be viable for everyone. But if you manage to save some money from some of the other suggestions, hopefully they could afford to let someone do the music, etc. I know a top rated DJ in the area that doesn’t charge any extra for it being a wedding – and yet others are charging a lot more for it being a wedding.